There are some places I've liked visiting , and some I've loved visiting - the difference being whether or not the location leaves a lasting impression. 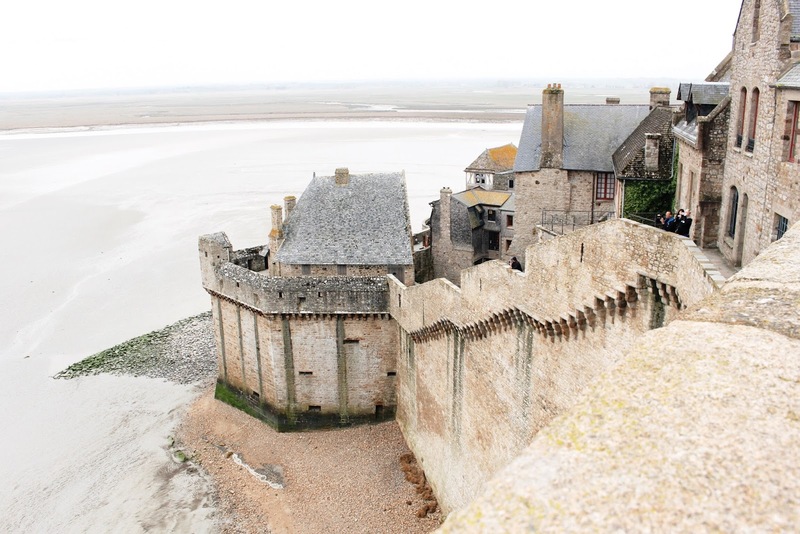 Sure, while in Normandy last week I'd travelled to Mont Saint-Michel expecting to enjoy my time there, though I absolutely wasn't expecting to still be thinking about the island one week later. It's safe to say it's now one of my favourite French destinations! 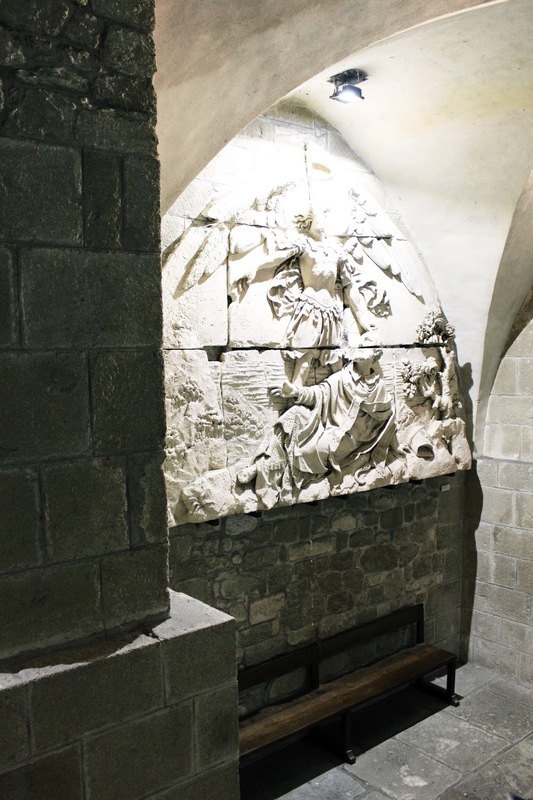 So, what makes Mont Saint-Michel so special? And how does it manage to make such an impact on an overcast day during mid-season? 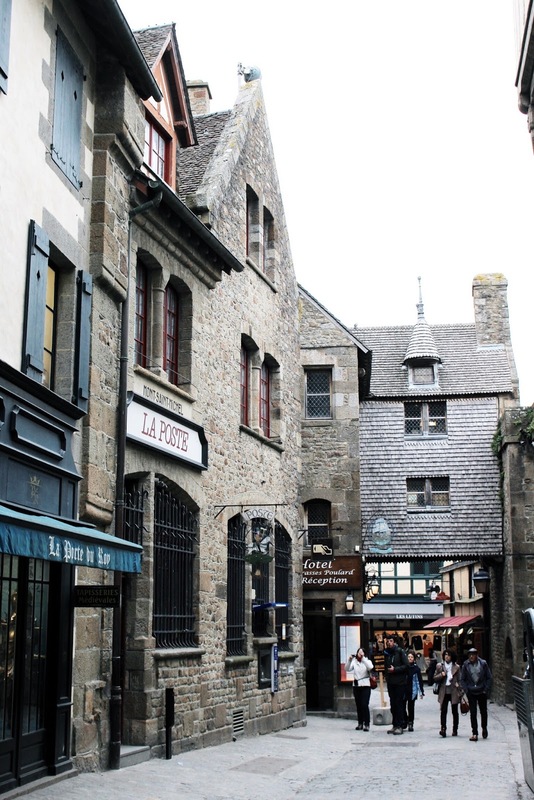 From what I've heard, Mont Saint-Michel attracts serious crowds come the summertime. Thankfully, I found myself exploring mid-season (March/April); a time that sees you escape being trampled into the cobbles, while still keeping you surrounded by the occasional group tour, family and loved-up couple. Besides the spectacular views, the most breathtaking element of my time there was probably the silence. Although it's only the Abbey that requests whispers, the entire island seems to adopt a sense of calm - and tourists follow suit. It's strangely beautiful, and something you need to experience for yourself. Trust me when I say you need to wear flat shoes when visiting the island. Really. Don't even play with the idea of wearing anything other than trainers. The journey to the top is steep at times, but the views provide the perfect reason to stop and soak up your surroundings every now and again. People walking along the bridge from the mainland become tiny dots in the distance, and after just an hour or two on the island, you'll have quickly forgotten most things that were bothering you and/or what country you come from. I guess that's the sign of loving a place? 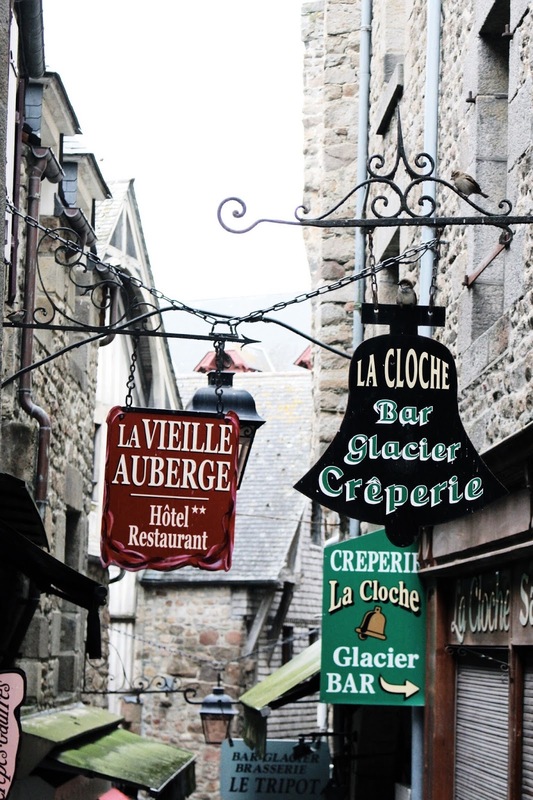 The 'anchor' to a visit to Mont Saint-Michel would best be described as the Abbey; a medieval architectural structure that (along with the entire island) has been a UNESCO world heritage site since 1979. The Abbey can be explored either with or without an electronic tour guide. Funnily enough, despite the rates online, I was given free entrance (high five) due to being under the age of 25 - but I've no idea whether that will stay in place during high season. The views from the Abbey are incredible, with some of the best spots being towards the end of a roaming visit, surrounded by plants around the side of the island. 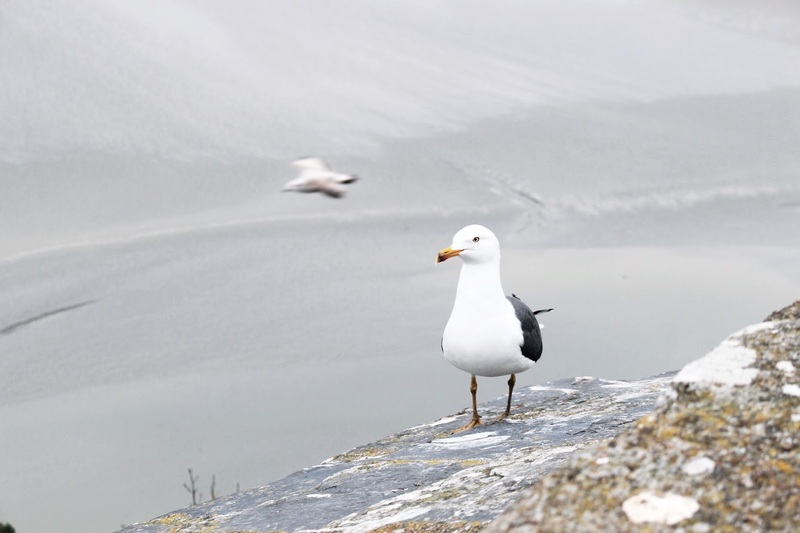 If seagulls are your thing, Mont Saint-Michel is your place. They're everywhere. Truth be told, I think they have an adorable arrogance about them. One literally stole half a cornish pasty from my hands last summer, and I've been in awe ever since. As I said, a week has passed since my visit and I still catch myself thinking about the island every now and again; I can't think of a single negative to draw from the place! 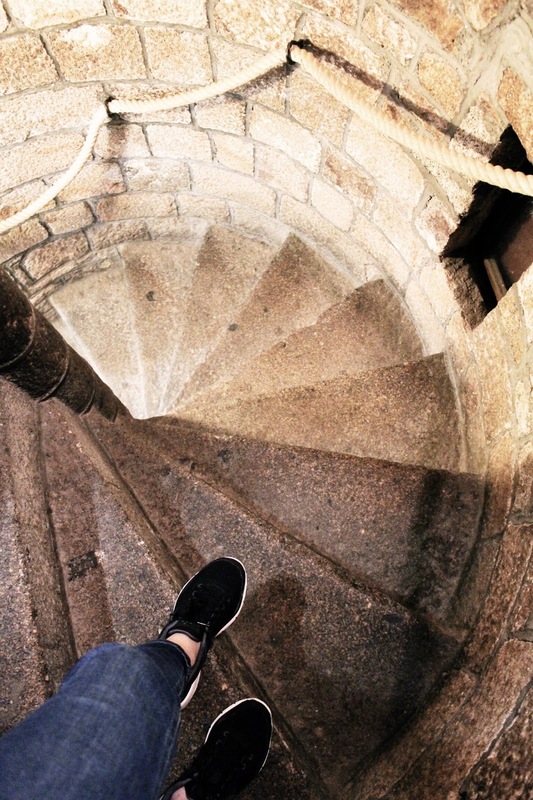 Though, Mont Saint-Michel wasn't the only adventure on the agenda last week. 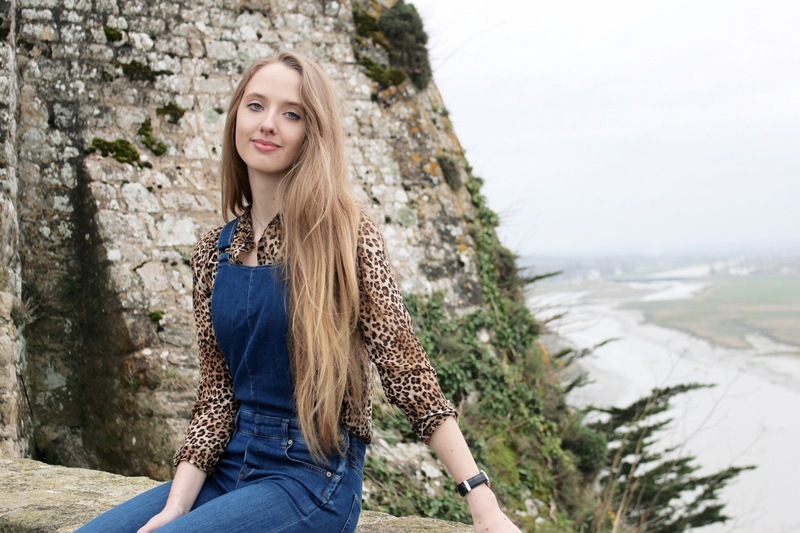 While in Normandy for a few days, alongside more relaxing moments spent lounging around the hotel and eating at small local cafés, I also checked out Granville - a seaside resort that takes on a whole new look when the sun shines. I'll be sharing a travel diary soon! I can see why Mont Saint-Michel has left such an impression on you...it is gorgeous (even in the "off season") Such stunning views and I love the quaint feel of the surroundings. I would so be the one wearing my stilettos, even after your warning lol! This is an incredible structure, the location of it being next to the water is outstanding. I would definitely pay a visit if I set my foot in France. 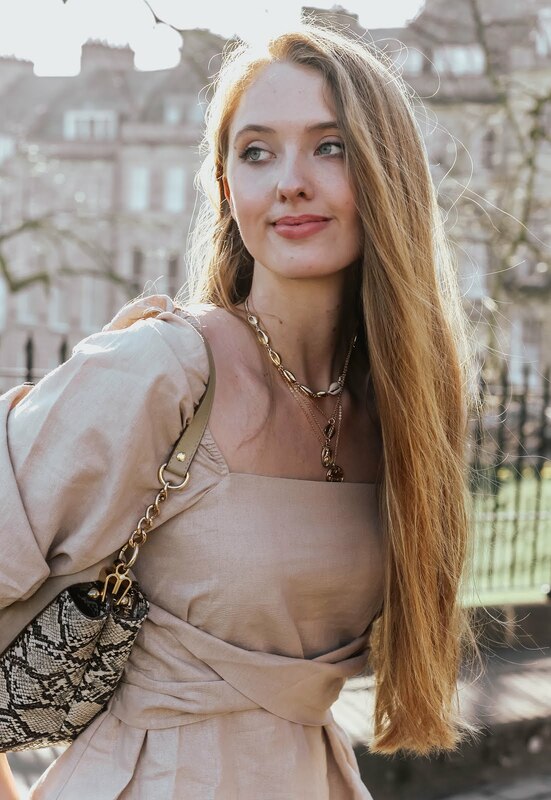 I always love reading your travel diary and your outfits are equally awesome. How cute is this place! It looks so beautiful, and I can definitely see why you'd want flat shoes for a trip like this. I'm loving your overalls look, too! Traveling off-peak season is seriously the best! Love all of these photos and I want a crepe now hehe. Love your overalls too! What amazing and beautiful pictures! I visited about 10 years ago and your pictures remind me of such a fun trip!! It's great that you visited out of season, and I agree that eating a crepe is a must! This is one of my favourite travel posts I've ever seen, this place just looks so beautiful it doesn't look real, that castle against the beach - stunning! I really want to visit mont saint michel now. I think I'd take a leaf out of your book and go off season. Also, you look stunning as always lady! What a beautiful French town. I'd love to visit it as well. I've always wanted to go to the Mont St Michel, such a beautiful and unique place indeed! It can be super crowded in the summer yes, with people coming from all over the world to see it. And one can understand why! The way you describe the silence there is amazing, I'd love to be surrounded by such a peaceful atmosphere. Also, your outfit is really pretty - you're almost convincing me to get a pair of nice dungarees! Girl this place looks beyond stunning - that castle looks like something from a fairy tale! Also, loving those dungarees on you lady! Wow this place looks absolutely amazing - the Abbey is beautiful! I've never really thought about visiting this part of France but I 100% am now! 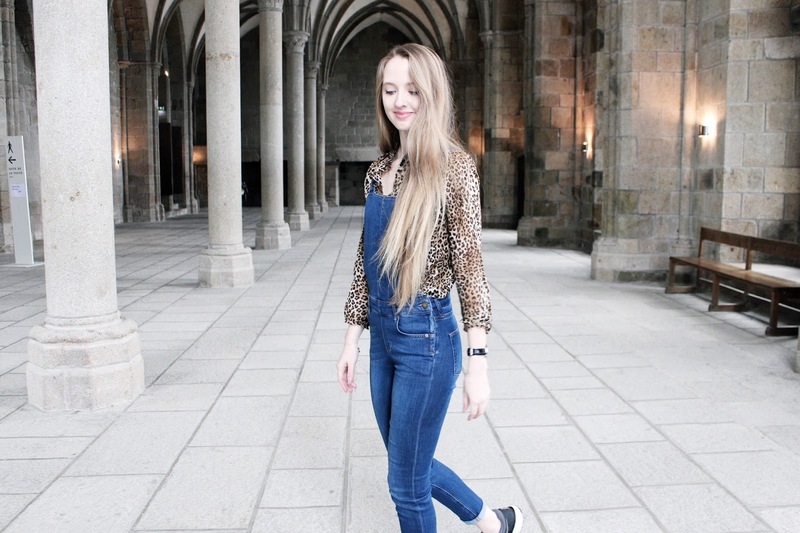 Also love your leopard print blouse with those dungarees! It sounds like a cool place. lovely photos. Wow this is absolutely amazing post, Gab! I always want to go to France. These photos are breathtaking beautiful! I am currently using photoshop and vsco cam, actually. I use it to edit my pictures for instagram and for my blog. They lose some quality but I love their filters too much! Oh wow, I can easily see why you loved this visit! I have major travel envy now. These photos are stunning, and the island sounds like a dream from your description. I wish I could book a post-Summer trip immediately. I can't wait for your travel diary! Beautiful photos! I love this post! It looks like a gorgeous place! Babe these pictures are absolutely gorgeous! I have been to France multiple times but never to this exact place, it look so lovely! I don't blame you for still reminiscing about that gorgeous getaway. I can also imagine myself being entranced by the place. Your outfit was not only fitting, but adorable - love the overalls with a leopard-print top, leather jacket, and sneakers. I remember visiting this place ages ago! I would love to go back! OMG I’ve visited Saint Michel when I went to France a few years ago and it's just as magical as you describe. These denim overalls are sooooo cute. 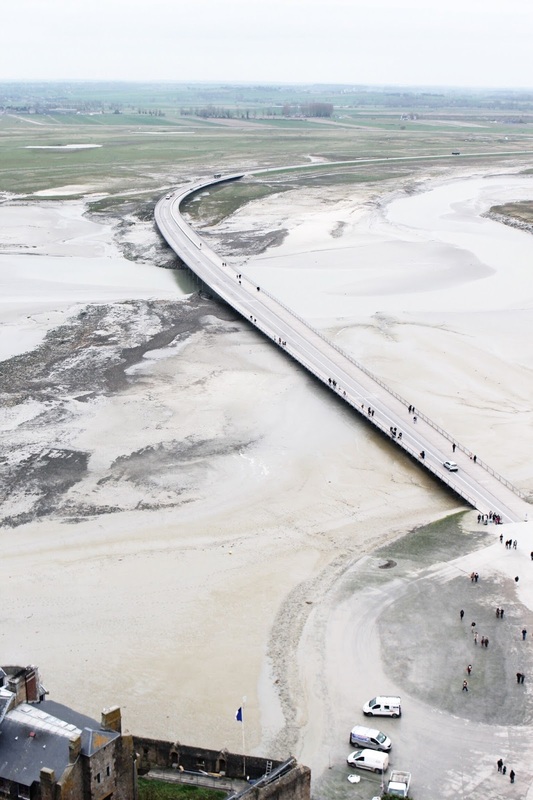 Ooh, I've seen photos of Mont Saint-Michel before and it looks so beautiful! Sometimes it can be hard to describe what makes us love a place so much, it's often not even a particular thing it can just be the vibe or feeling of the place that leaves such a lasting impression, but of course it helps when it's got a beautiful view too. Where did you get those overalls! I love the way they look and the way you styled em with the cheetah print! This place looks absolutely incredible! I always love the architecture of older cities especially like stone walls and small streets. I can see why it's such a tourist destination. The silence you mentioned sounds so incredible because it's always nice to actually have that chance to just take in the view and disconnect a bit. So sad I'm gluten free because crepes are to die for! That last shot looks like something from a Harry Potter book. It's almost like Hogwarts castle. You have the best travelling experiences! I love your denim and leather combo also! 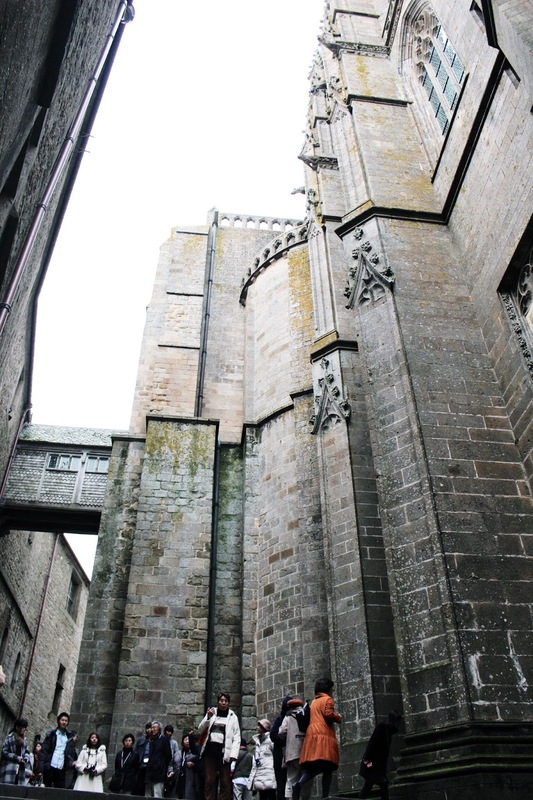 Mont Saint-Michel looks like a truly special place, the views from the Abbey are stunning - gorgeous photos! Looking forward to reading all about Granville. I have never heard of this island before and now I want to go so badly. I love the way you capture your travels, Gabrielle! I love traveling places mid-season to avoid crowds - it makes for a much more special experience. You look so gorgeous as per usual - in love with those overalls! Mont Saint Michel looks like such a beautiful place! I've never really heard that much about it but now it's going straight on my list of places I have to visit! Your photography is so great in the post as well, I feel like you've really captured what it's like to explore the island (and the seagull looks very cute)! You look lovely too, I love your outfit! It's truly glorious! I love the store signs. They're so charming. Awesome buildings. 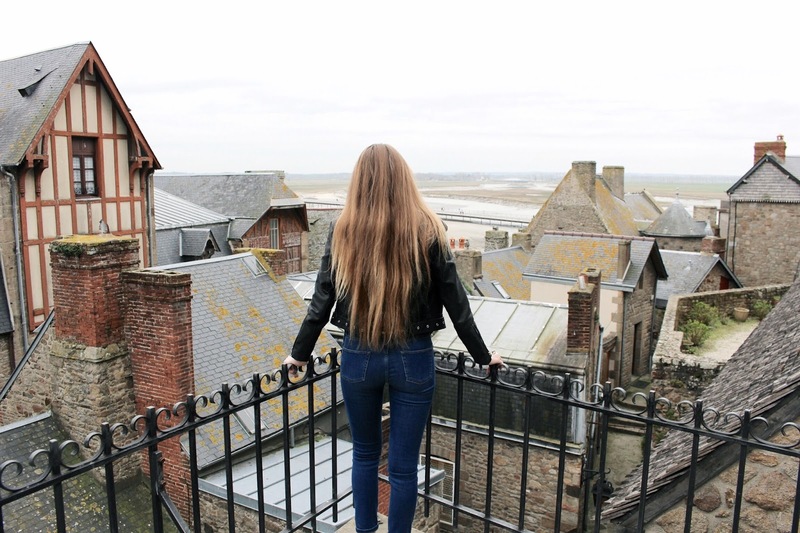 I've never heard of Mont Saint-Michel before, it looks so charming and I love that it has a tranquil spirit, I love that when traveling to places with such rich history and captivating architecture, it's less distracting and you can fully soak it all in! Thanks so much for sharing your time spent, it's great to know of other places to visit when in France, other than the most well known, Paris. I hope you're having a great week so far, beautiful! These are beautiful photos. Such a charming place. Castle by the sea! How amazing- I'm loving these shots, doll! 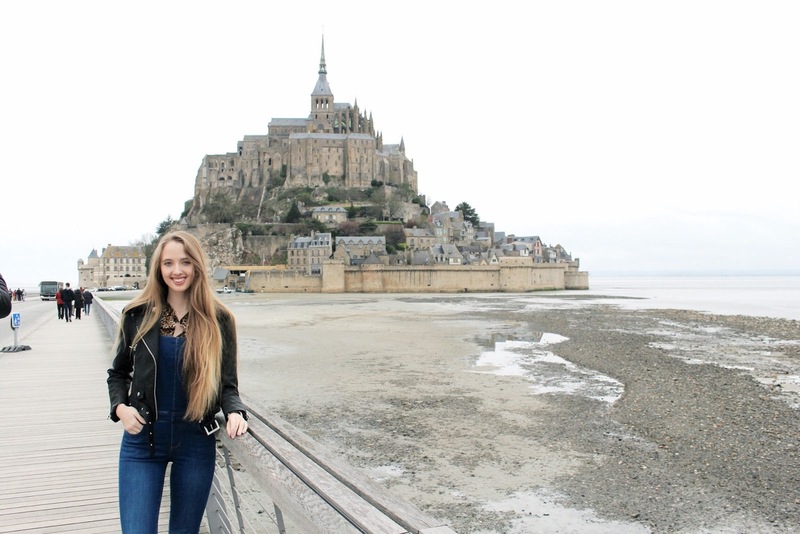 I've visited Mont saint Michel in a summer of a lot of years ago with my family and I've got many beautiful memories of that place even if I was a little girl! It's definitely a place woth to visit! Wow, Mont Sanit Michel looks beautiful! I love places that are obviously 'charged' with with history in every corner, every little alley, like this place seems to be. Even before I read that you loved the silece of Mont Saint Michel, I had that feeling of peace and tranquility through your photos. Oh and you look absolutely stunning in that last picture of you! This place just looks amazing girl, I love the landscape and all of your outfits were super chic! Wonderful photography and narration Gabrielle! Love visiting places through your eyes. Have a great Friday darling. 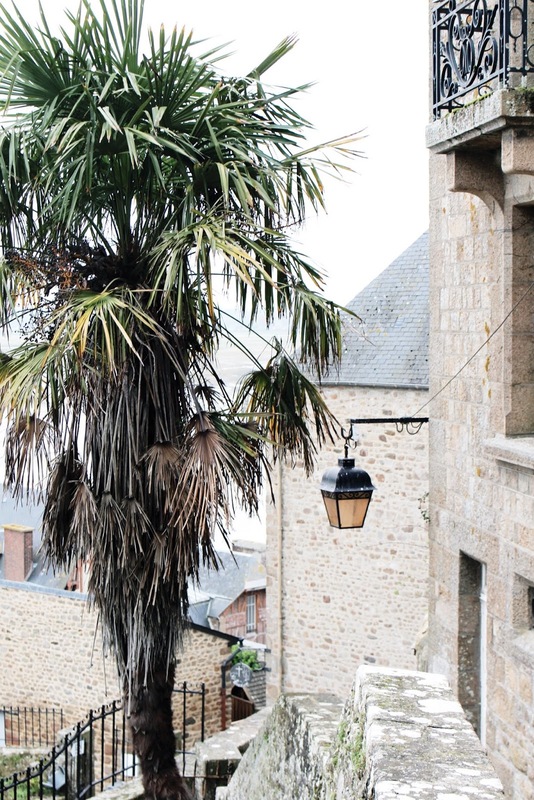 This little French town looks soooo beautiful and quaint!! I'll be visiting France this summer, hopefully I'll have time to swing through :) love your photos babe. Looks like such a charming place and as always your images are stunning Gabrielle. Have a lovely weekend. Stunning place I am living vicariously through your travels. Lol. You look gorgeous as alwways! What a gorgeous island! I visited Normandy on a school history trip when I was 12 but in all honesty, I was too young to really appreciate the area. I would definitely love to return and check out Mont Saint Michel. I love visiting places off-season away from the crowds as you really get to grips with a place that way. There's nothing worse than overcrowding especially when somewhere is as quaint as Mont Saint Michel! Wow that looks so nice ! I've been to Bretagne/Normandie several times (like a looooot) though I've never managed to catch a glimpse of the Mont Saint Michel. Such lovely and stunning pictures ! It makes me miss my country haha'and the "crêperie"! 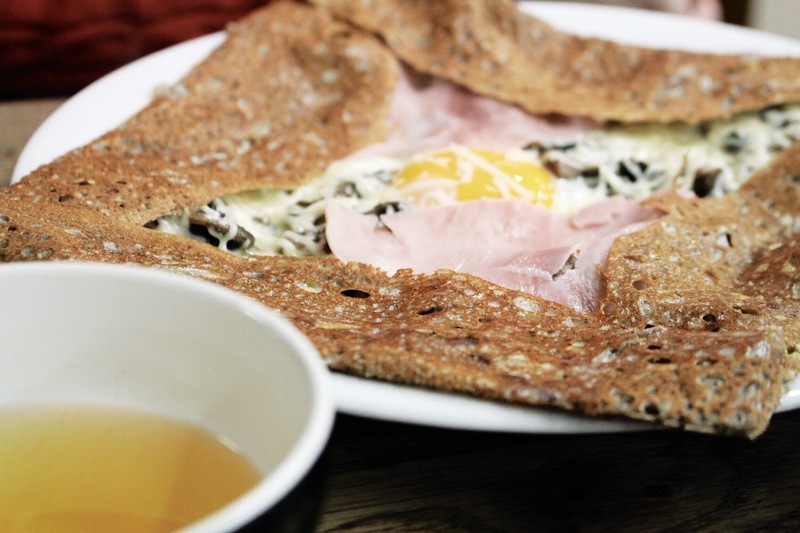 I want a galette so bad now haha'! I love your overalls matching with this leopard print. I'm glad you enjoy your trip there. Lovely photos, Gabrielle. Mount-Michel is one of the must destinations for me. It's great to go mid-season so that you can enjoy it with no crowds. Such a beautiful post! 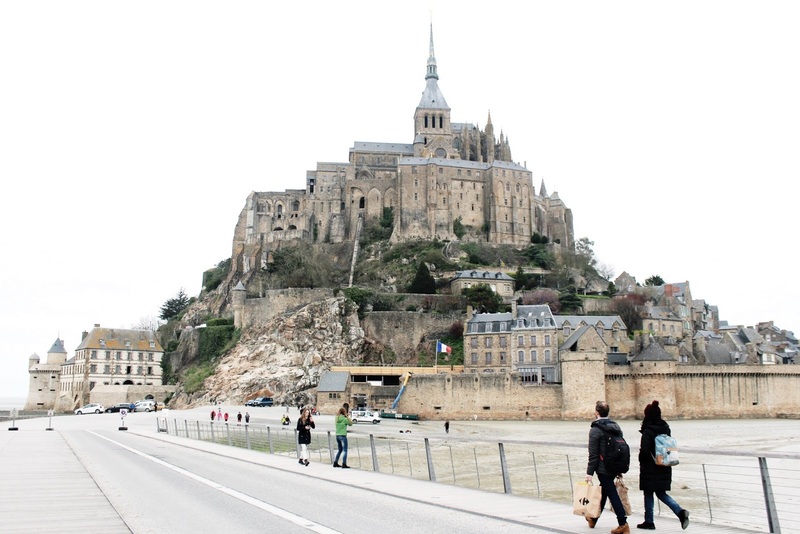 OMG, Mont Saint Michel is on my bucketlist since...forever! The place is magical, I am glad I can see it from your point of view, it looks more personal so thank you for sharing the details of this place. Oh and that view... Amazing! This place looks beautiful!! Would love to go there one day! This place looks so pretty. Love the photo selection.